Servycompu Review 2019: Is Servycompu a Good Hosting? Servycompu International is a relatively small U.S.-based shared hosting vendor that was established more than 15 years ago. Better suited to small businesses and individuals, this vendor does not have the hosting resources to support heavy websites with complex databases. 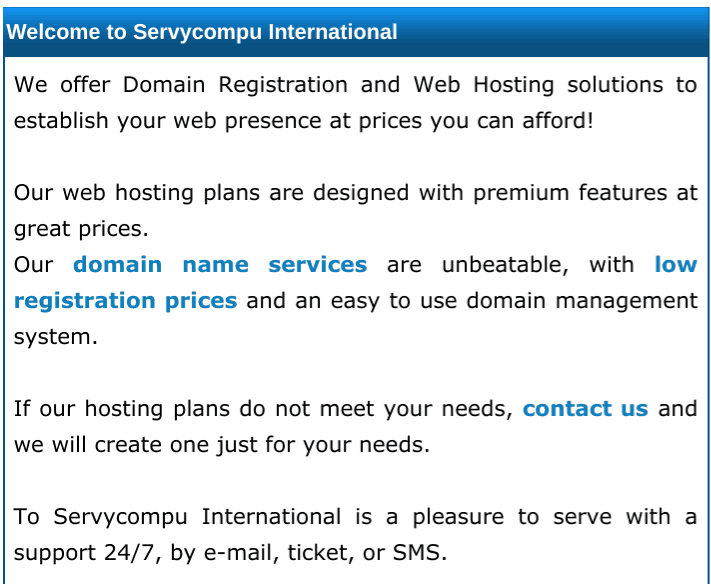 Servycompu International (or simply ‘Servycompu’) is a small U.S.-based hosting company that was established more than 15 years ago. This vendor offers web hosting and domain registration services to individuals and small companies seeking to create and maintain personal blogs and small business websites. The Servycompu website is available in both English and Spanish. Servycompu provides four main hosting packages to choose from according to your business needs. The student plan is the most basic and comes with basic features including 500MB disk space and 2GB transfer bandwidth. The budget plan, on the other hand, comes with 1.5GB disk space and 5GB transfer bandwidth. Both plans are best suited to small personal blogs with low demand for hosting resources. Small and medium-sized businesses can upgrade to their premium or corporate plans. The premium plan comes with 4GB disk space and 10GB transfer, and it supports 10 MySQL databases. The corporate plan includes 10GB disk space, 15GB transfer bandwidth, and 15 MySQL databases. While Servycompu maintains backup copies of its clients’ accounts for disaster recovery purposes, it does not commit to helping users recover individual files or recover from accidental deletions. Users are responsible for the content of their own website(s). While seemingly affordable, these premium and corporate packages have some notable feature limitations such as not including SSD storage. Other features that Servycompu offers include website templates and 256-bit encryption SSL certificates. Servycompu’s hosting plans come at pocket-friendly U.S. dollar prices. They only offer an annual billing cycle, but this major commitment is to some extent mitigated by their 30-day money-back guarantee that allows you to take them for a relatively risk-free test drive. Although a good number customers express satisfaction with this vendor’s network availability, the company shies away from offering an uptime guarantee. Clients with queries or concerns can contact Servycompu’s 24/7 support team via email, ticketing system, website contact form, or live chat. The vendor also offers SMS support, but no telephone support. They are quick to respond and are quite competent when handling emerging hosting-related issues. Servycompu’s knowledge base has very little hosting information, but the FAQ section is more comprehensive. While Servycompu does not have the hosting resources to support heavy websites with complex databases, this vendor does deliver excellent hosting solutions for small businesses with minimal workloads. Wondering how Servycompu stacks up against other Web Hosting companies? Enter any other Web Hosting company and we will give you a side-by-side comparison.